Back-to-school season is an opportunity for military parents to teach their children money management lessons. The lessons aren’t hard to teach. Parents can start with a few basic guidelines that are as easy as A, B, C.
In just a few short weeks, military families across the country and at installations overseas will begin the annual ritual of helping their children ease into a new school year, often at a new school in a new town. 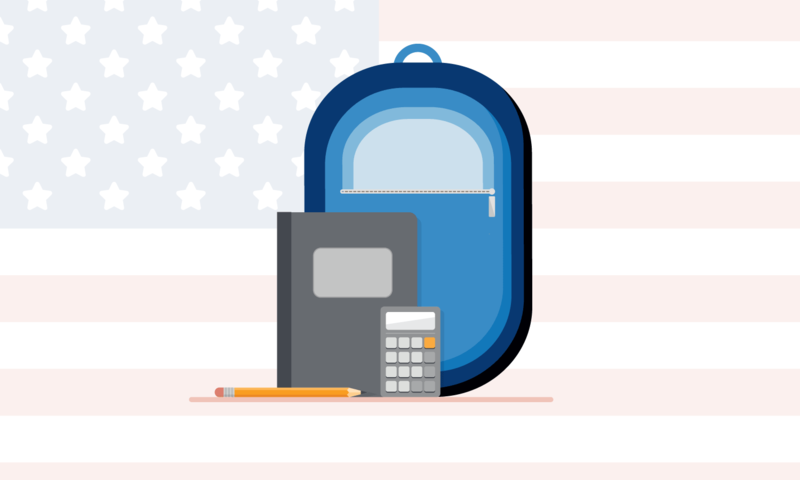 As a military parent, you might already be shopping off a back-to-school list or looking for activities to help your child prosper in their new environment. Back-to-school supplies and some of those new activities are going to cost money, possibly more than you were spending at your last location. This year, try using back-to-school season as an opportunity to teach your children money management lessons. These easy lessons can help your child succeed at school and life in general. You can start with a few basic guidelines, outlined below, that are as easy as A, B, C.
Adaptability is one of the strengths of military children. Frequent moves will do that! If your family is changing duty stations, talk to your kids about how the cost of living might change from your old base to the new one. Give them an opportunity to come up with ideas about how to manage the new costs of some of the family’s activities or expenses. Your kids can benefit from hearing your thoughts as you plan for a move. If you’re not moving, consider giving them some of the details about your budget and the ways you prioritize spending or saving. They can learn by seeing how you make decisions and trade-offs, and it can help them understand why you can’t buy items they really want right now. If you give your 5-year-old and 15-year-old each a $20 bill, would they spend it on the same thing? Probably not, because your children have different age-related ideas of what could be done with $20. The same rationale applies to how children learn about money. You can focus on helping your children develop consistent money management habits through three main developmental stages: Pre-elementary school (ages 3 to 5); elementary to middle school (ages 6 to 12); and high school and young adulthood (13 and beyond). Since they’re constantly observing you, create opportunities for them to observe you making decisions on things like spending, earning, sharing, borrowing, and of course, saving. Give them the chance to think through and practice some of those concepts themselves through everyday activities. For instance, you might let your 5-year-old “help you decide” whether the family gets more for its money by buying a bag of their favorite cookies or a gallon of their favorite ice cream for a midweek dessert. For teenagers who might have had their first summer job, take the opportunity to help them understand how far their post-tax earnings will go towards the small things they want to buy now and the big purchases they’ll need to start saving up for. You can also help your college-bound children by “war-gaming” scenarios that let them think through different money situations they might face at school such as signing up for their first credit card or making a budget for rent and groceries. Regardless of their age, your children are digital natives. Leverage technology, where you can, to help them learn money lessons in a style that’s instinctual to them. Our Money as You Grow page has activities and conversation starters that you can use to help your children develop skills, habits, and positive attitudes about money. You can also visit other trusted sites like Kids.gov , the Federal Deposit Insurance Corporation’s (FDIC’s) Money Smart for Young People Series , or Mymoney.gov . Whether you’re stationed at Camp Pendleton, California, or Caserma Ederle in Italy, you have the same access to an array of educational money websites, apps, and games geared towards children. A transfer to a duty station overseas, where the money is different, can be a great opportunity to get your child thinking about the value of money and what it will buy. Whether it’s a dollar, euro, or a yen you can use conversations about different currencies as an opportunity to talk about money. For example, I remember when we were in Europe (before the euro), my first-grader brought me a handful of German, Belgian and U.S. coins and asked what I would give her for them in dollars! The calculator definitely came into play, and it was also an opportunity to have a conversation about what she wanted to spend the money on and whether it would be better to spend it or save it. You can also take advantage of base resources like your installation’s Personal Financial Manager or family resource center to get sound advice on ways to teach your kids about money management while honing your own skills. Whether you’re the parent of a new kindergartner making the transition to a “big kid school,” or a college-bound teenager starting the transition to adulthood, back-to-school season is full of moments that can help you teach your children lessons about money management. But remember, a lot of good habits can start at home. Regardless of what they learn in school this year, they can learn many important life lessons by watching you, and smart money management can be one of those lessons.